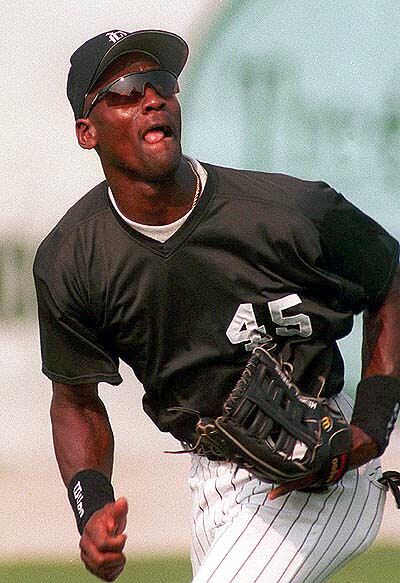 On his 50th birthday, I thought it would be fun to take a look back at Michael Jordan’s brief career as a minor league ballplayer with the 1994 Birmingham Barons. What’s crazy to me is that a lot of you reading this weren’t even born when Jordan first walked away from basketball. After his father was murdered, Jordan had lost his passion for basketball (temporarily as we’d come to find out) and decided to give his first love, baseball, a try. For a 31 year old who hadn’t played baseball since high school, Jordan held his own. He hit for a low average, but managed to drive in 50 runs and steal 30 bases in a full season. Jordan seems to have swung a few different Louisville Sluggers, including the 34-inch, 33-ounce P72 model you see above. (So cool that Louisville Slugger branded it for “MICHAEL ‘AIR’ JORDAN”). You can see the P72 in the below photo. He also swung a C271. Both models are available online. 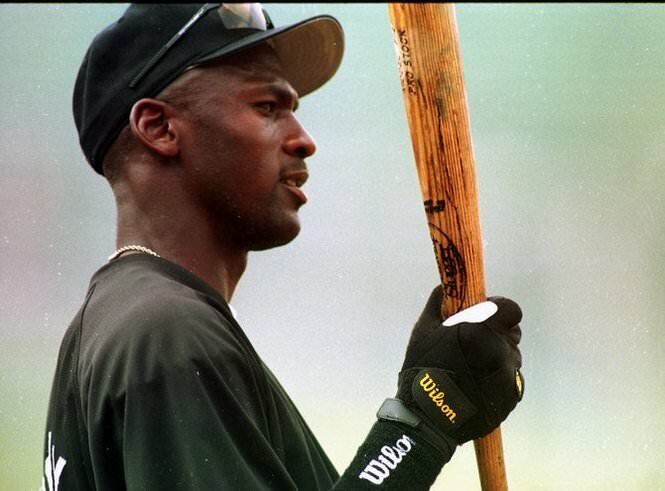 Jordan played before the Jordan brand started making batting gloves, so you can see in the above photo he wore some sort of primitive looking Wilson batting gloves. I’m going to go out on a limb and say you’re probably not interested in these. On his feet, most importantly of course, Jordan wore the Air Jordan IX’s that you see in the feature. Obviously these aren’t something you’ll find in stores, but as you know, Jeter wears Jordan brand cleats that don’t look half-bad either. Just this past NFL season, a few players paid homage to the IX’s on the gridiron. Here’s a good look at those from SoleCollector.com. The video above is a must-watch if only for the utterly ridiculous sunglasses MJ wears in an interview. For a fashion ICON, Jordan has dressed like a straight-up buffoon at times. In the video above, Jordan is interviewed by Chicago-legend Harry Caray and there are some awesome highlights of Jordan playing in a spring game at Wrigley. Just not something you see every day. That wraps up WhatProsWear.com’s rookie year! I really appreciate all of you who have visited the site and especially those who have contributed. You’ve motivated me to keep working at it and getting better. Much more to come!